The 3 volume Japanese ‘Jimmy Corrigan’ translation nears completion. Unsurprisingly, both this and the Chinese translation show insane attention to detail. The opening credits to Tron, re-imagined in the style of Saul Bass. This appears to have been generated by a 'things Adam likes' machine. The Shrine Down the Hall. The bedrooms America's young war dead left behind. The images Jim Lee posts to twitter are amazing for comics-process nerds. This particular image is a great example – there are sections in all states of completion, showing the crazy range between the roughed-in Flash and Cyborg at the bottom to the completed Batman and Green Lantern at the top. I still maintain that someone should publish a series that is just Jim Lee PENCILS – no inking necessary. 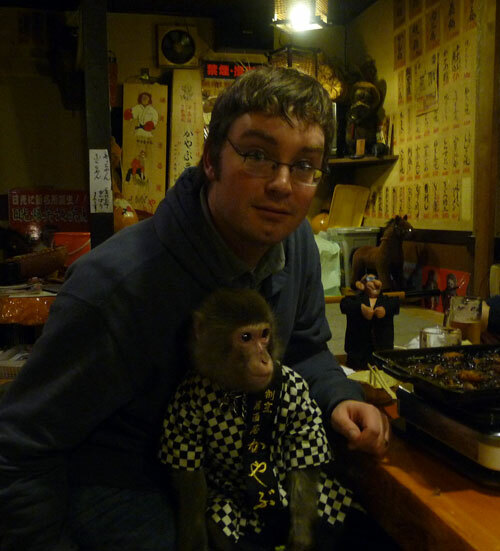 I was in Utsunomiya, Japan, being waited on by a monkey named Fuku-chan. For some reason, the universe decided that today was the day that I should articulate exactly why I like the music of Joanna Newsom. Over the course of the day, I found myself involved in three wholly separate conversations (One over twitter, one over email, and one in person) where the other party was asking me why I was so fervently aboard the goodship Newsom. Arrangements: I reserve special admiration for people who can put together 12 minute songs that focus on story and songwriting and not ‘Jamming.’ The fact that the music to these marathons doesn’t wear or become horrifically repetitive is also a worthy achievement in my opinion. Enlisting the likes of Van Dyke Parks to throw together her string arrangements also certainly helps. Singers that can be described as ‘demonstrative’ are usually pretty touch and go for me – ‘look at me I’m sad’ or ‘look at me I’m angry’ or ‘look at me I’m really FEELING this part’ will almost infallibly result in a big ‘NO THANKS,’ but something about ‘look at me I’m a really happy crazy grandma’ gets a pass from me. I can’t explain it. The voice: I get that people hate the voice affectation, and I totally understand that being the polarizer. For some reason, though, it’s never bothered me. For what it’s worth, I think her voice has definitely been ‘softening’ from album to album. A lot of the abrasive, crackly edge that you hear all over the first album is rounded off on the latest one, while the character and weird-metered delivery are retained. Finally, I’m not gonna deny it, she is very fetching. Ok, end of email. While digging around on youtube for examples, I found the video below: a really nicely-done cover of Newsom’s ‘Book of Right-on,’ edited in the ‘Pomplamousse‘ style. The percussion and harmony accents are particularly slick. Japanese urban legend: the cursed Kleenex commercial. Cursed or not, that is easily one of the creepiest commercials ever.